Developments in aviation cyber security have had a significant impact on the wider aviation and cyber security markets. Visiongain’s report on this sector gives a detailed overview of the market, creating an accurate picture that will offer clarity to anyone involved in the aviation or cyber security markets. 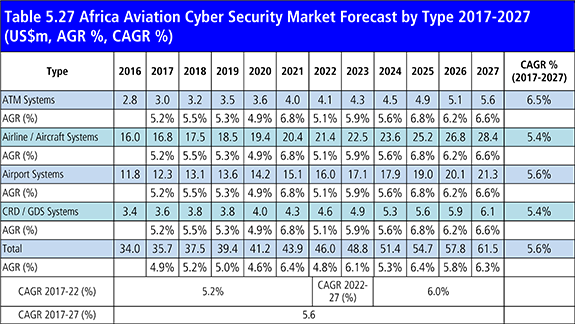 Importantly, the report also delivers a forecast of the market, giving you an insight into the future opportunities that exist in the aviation cyber security market. Visiongain believes this market will be worth $2bn in 2017. With 180+ tables and charts and a total length of over 250 pages, this report is a fantastic opportunity to increase your knowledge of this sector. SWOT/PEST analysis tables, as well as analysis of the drivers and restraints for the overall market concisely informs you of the major factors affecting this market, whilst visiongain’s data-rich approach provides greater insight into this market.